Long Island Restaurant News | Surf & Turf Sundays, Wine Down Wednesday and More at Monsoon Steak & Sushi! Surf & Turf Sundays, Wine Down Wednesday and More at Monsoon Steak & Sushi! The summer season is coming to an end and there’s no better way to welcome a new season than with new promotions and deals. 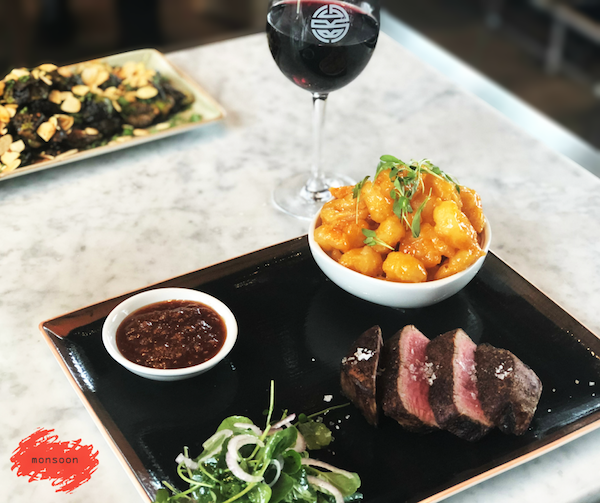 Monsoon Steak and Sushi, an Asian lounge that showcases a refined blend of Asian cuisines in exquisite fashion, offers small plates to share, sushi specialties, black angus steaks and so much more, including promotions offered on Sundays, Wednesdays and Fridays! Looking to enjoy a special night with the one you love? Nothing says date night like Surf & Turf Sundays! Surf and Turf selections are available for $25 every Sunday and include: Filet mignon and spicy rock shrimp tempura served with tempura batter, spicy mayo and sweet chili sauce; New York strip steak with shrimp and lobster wontons served with a pan-seared hoisin glaze and miso-mustard; and Mongolian skirt steak and crab cake served with dry aged skirt steak with Mongolian marinade, red crab, chipotle cream and charred tomato watercress salad. Monsoon Steak and Sushi will also be participating in Long Island Restaurant Week from Sunday, November 4 through Sunday, November 11! Click here to view a full schedule of events and call (631) 587-4400 to make your reservations.